Robert M. Serjeant was the only son of Theo and Alice Serjeant, and grandson of famed mine manager R.M. Serjeant (1829-1902).Robert Serjeant was a past student of the Ballarat School of Mines (SMB), and at the time of his enlistment he had just finished an electrical course, and was working as a junior member of the SMB Department of Electricity. Robert Sergeant enlisted in December 1914. Corporal Serjeant (2138) of the 8th Battalion, died of wounds received in action at Gallipoli on 28 April 1915, aged 20. He was buried at sea and his name is listed at the Lone Pine memorial. A brown paper parcel of Robert Serjeant's belongings was returned to his parents. It contained his discs, wrist-watch (damaged), notebook, hymn book and letters. 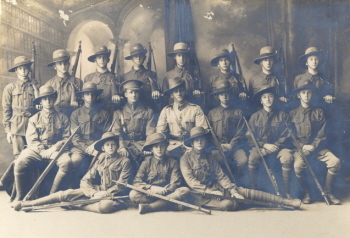 Image caption (LHS):Ballarat Junior Technical School Senior Cadet Team, 1918. (Cat. No. 0202) In 1918 The BJTS cadets won competitions at Stawell, Colac, Maryborough, St Arnaud, Mildura and Ballarat's South Street 'A' Grade. Back: R. Hirt; P. Trompf; J. Nicholls; ROBERT SERJEANT; J. Jones; A. Hannah; A. Duncan; L. Lindsay. Centre: H. Ashley; H. Beanland; J. Finlayson; F. Larkin; G. Chambers; A. McCallum; T. Shattock; E. Rowsell. Front: Sgt A. Roe; J. Dulfer, Mjr Tucker; Lt H. Wakeling; Sgt-Mjr Reeves; Sgt K. Krahnert; W. Middleton.